Little Princess presents this adorable money box; perfect for keeping those precious pennies safe! 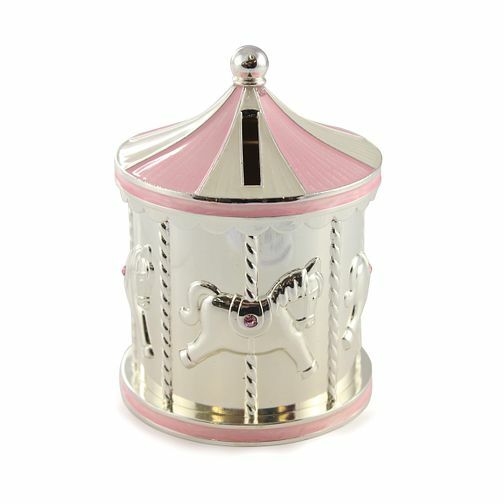 Set in an elegant carousel design, this silver plated money box has pink detailing across the base and roof to create a striped design. Little Princess Silver Plated Pink Carousel Money Box is rated 4.8 out of 5 by 4. Rated 5 out of 5 by Anonymous from Great little keepsake Bought for a christening gift and am really pleased with it. Better than it looks online! Rated 4 out of 5 by Anonymous from Excellent Christening present I bought this as a Christening gift. It is very pretty and a little unusual compared with other gifts I looked at. I am very pleased with it.